Diatoms are a major group of algae and are one of the most commonly found type of phytoplankton. They differ from other single celled algae, in that they are encased within a silica shell or frustule. The shape of the frustule is used to identify the different species and some are both elaborate and very beautiful. Diatoms exhibit a ‘boom and bust’ behaviour, rapidly increasing in numbers when conditions allow only then for the population to crash as quickly as it grew. These blooms tend be very seasonal and tend to occur in the spring and autumn. 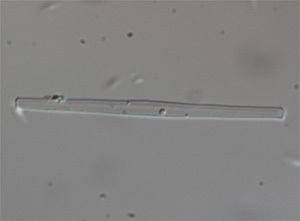 In most situations, diatoms do not pose much of a problem, however in reservoirs where the water is to be used for drinking supplies they can. This is due to the fact that as the silica shells do not degrade and as such they cause a serious problem in filtration plants as the shells clog the filter beds, reducing filtration efficiency and thereby increasing treatment costs. We have been involved in trials with a large UK water utility company and a leading university in a study to determine the benefits of using ultrasound to control diatoms in drinking water reservoirs. If you are experiencing diatom problems in a reservoir, please contact us. 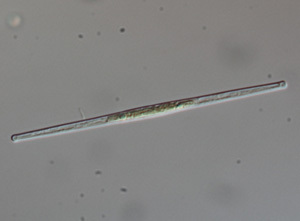 The images below are those of the diatom Fragilaria sp, the image on the left is that of a healthy diatom, the one on the right of a diatom that has been subjected to ultrasound from one our units – the cell contents have been destroyed.